Two satisfied customers pictured last September at Arthur Swallow Fairs’ biannual decorative and salvage event held at Ripley Castle, near Harrogate. 1 Arthur Swallow Fairs’ first 2019 date for its decorative, and salvage shows is the three-day biannual fair held in the atmospheric surroundings of the 14th century Ripley Castle, near Harrogate in North Yorkshire. It runs from Friday to Sunday, May 10-12. Swallow launched this event in 2012 along with a second at the Cheshire Showground in the same year, plus a third at Loseley Park, near Guildford, in 2014. Swallow’s next event is the vintage fleamarket held at the Lincolnshire Showground, on Sunday, February 17. 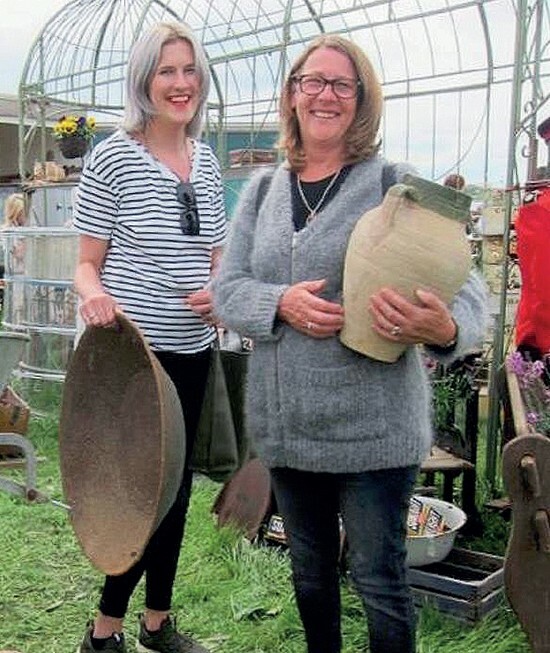 Molly and Maud’s Place, aka mother and daughter Karen and Chloe Rymer from York, is among the returnee dealers standing at the Fawley Decorative Fair this year. 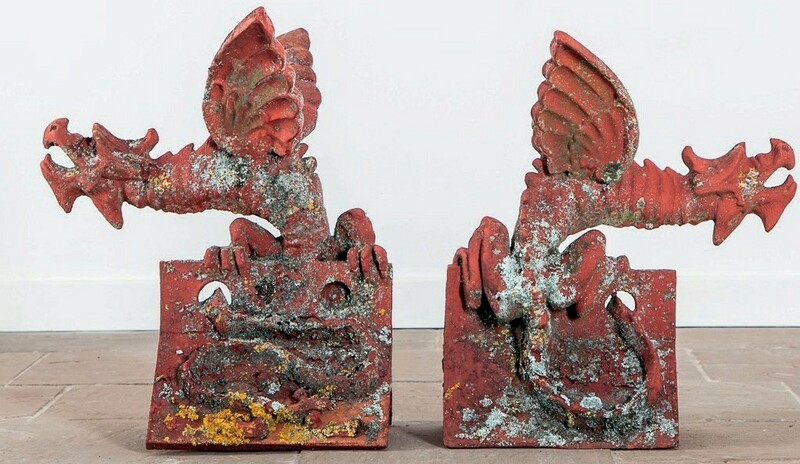 Among the stock they bring to the fair the Rymers usually have an interesting selection of garden and architectural pieces including, currently, these two handmade mid to late-20th century terracotta ridge tiles in the form of dragons. Produced by the Keymer Brick and Tile Company, maker of handmade roof tiles in Sussex since the 16th century, they are priced £895 for the pair. 2 Thornton Kay of Salvoweb and organiser of the annual long-running Salvo Fair has been in touch to say “the fair will not be happening again this year due to work pressures”. Kay’s most recent Salvo Fair was in 2017 at the Fawley Hill Estate. However, Judith, Lady McAlpine is running the second Fawley Decorative Fair at her estate, near Henley-on-Thames, from Friday to Sunday, May 31-June 2. The first fair was held last year (when Salvo was postponed). Lady McAlpine said: “Tickets are already selling and we are hoping for 5000-7000 attendees based on last year’s gate. A view taken at a past Bentley Fairs’ salvage and vintage fair held at Knebworth Park in Hertfordshire. 3 Sharon Blagrove of Bentley Fairs launched her annual salvage and vintage fair at Knebworth Park in Hertfordshire in 2014 and the upcoming fair runs on May 25-26. Local dealer Retrovation, which sources, sells and hires vintage props and decorative antiques, has rebooked from last year. Its website includes haberdashery shop display items: hat and shirt stands, a Sylko cottons cabinet and a Victorian needles cabinet.